At Baumatic we have you in mind when designing the features of our appliances. 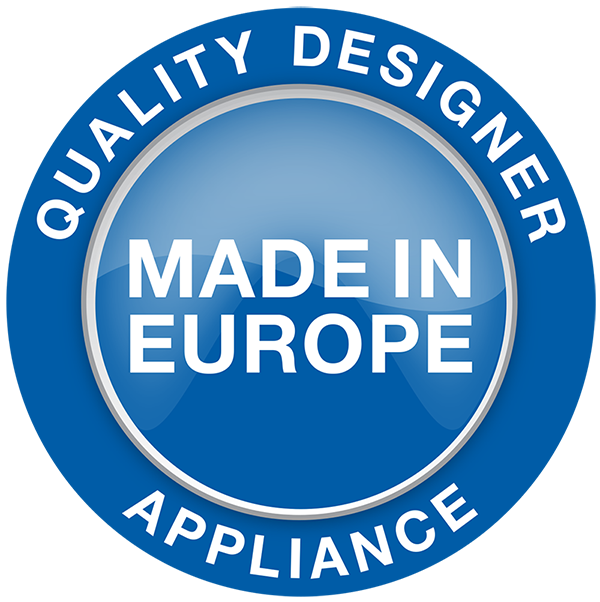 All our appliances are manufactured to exacting standards and sourced from the world’s best suppliers, Our point of difference is that each product is designed with features and functions that suit Australians working in Australian kitchens. At Baumatic we strive to make your every cooking experience a successful one. With a 10 amp plug you just plug your oven in and use. No need for an electrician or for it to be hardwired. The 14 place setting capacity is ideal for large families and dinner parties fitting more dishes in one wash. The addition of a third pull out cutlery tray at the top of dishwasher creates more space in the bottom basket to load more dishes. A fully loaded adjustable top basket creates room on the top level for large glasses or the lower level therefore allowing a 31cm plate to be loaded in the bottom basket. The 3D cooking function allows you to cook different dishes at the same time with consistent results. Utilising all the elements, as well as the fan, the food can be cooked with maximum efficiency, saving time and energy. Ideal for roasts + pastries. Extra large 81 litre gross oven cavity space. Cook for a crowd. There’s room to cook for even the largest of families with the biggest appetites in our market leading large capacity ovens. With a large 85 litre gross oven capacity there’s room to cook for even the largest of families with the biggest appetites. Medium washing machine capacity. Suitable for 3-4 people. Each load can wash approximately: 7-8 towels OR 7-8 outfits OR 1 double or queen duna. With a large 94 litre gross oven capacity there’s room to cook for even the largest of families with the biggest appetites. If the dishwasher detects a water leak or pressure loss filling from the tap will stop to protect against the potential of flooding. The auto wash sensors automatically adjust the wash and temperature saving money and ensuring an efficient wash.
Baffle filters have a commercial style modern stainless steel finish with highly efficient grease removal. Easy cleaning – dishwasher safe. Cavity Cooling fan technology moves ambient air, cooling and protecting both the electronics of the oven and the cabinets in which the oven is housed. A stainless steel frame for durability and to help protect the glass from chipping. Clever design makes cleaning the oven easier and less time consuming. The one piece interior construction and large inner glass door ensures there are fewer crevices for fat and grime to build up in. The oven door is also removable for easier access. 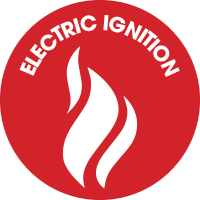 Electric ignition of the burners is safer and easier to use. Simply hold the knob down with one hand and twist and the selected burner will ignite. Our fan assisted function ensures that heat is more evenly distributed throughout the oven. This means that you can cook different foods at multiple levels of the oven all at the same time and still achieve outstanding results. Use of the fan also means faster cooking times and lower energy consumption. Our fan forced function ensures that heat is more evenly distributed throughout the oven. This means that you can cook different foods at multiple levels of the oven all at the same time and still achieve outstanding results. The fan forced technology also means faster cooking times and lower energy consumption. Although the cooktop has a larger 70cm cooking surface area it actually fits into the standard 60cm space. This makes it an ideal replacement model as benchtops do not need to be altered in order to gain extra cooking room. With our Flame Failure Safety feature if the flame is accidentally extinguished for any reason then the gas supply will automatically turn off preventing a potentially dangerous gas build up. The flexizone induction cooktop has all the benefits of induction technology like instant and precise heat level adjutsments but also adds additional flexibility. This means that you place multiple pots and pans of all shapes and sizes anywhere on the flexible cooking zone. Our closed door grilling system helps prevent inquisitive fingers exploring inside the hot grill, small heads bumping into an open grill door or being splashed by hot fat as well as helping to seal in the moisture and flavour of the food. The grill also has easy slide telescopic runners that glide in and out. The high speed spin means clothes will be drier and less creased after every wash. In an induction cooktop energy is supplied directly to the pot by the magnetic field. This means that it is the pot, rather than the cooktop, that is the source of the heat. This means that you are able to adjust the cooking heat level instantly and with precision. As the energy is supplied directly to the pot, this means faster cooking times, a cooler kitchen and a cooler cooktop. There’s room to cook for even the largest of families with the biggest appetites in our large capacity ovens. Powerful air extraction to purify the air of smoke, steam and odours. The Baumatic pyrolytic function uses high temperatures up to 500Ocelsius. Our quadruple glazed glass doors keep the oven surface temperature safer and cooler. A full load can be washed in just 30 minutes with our super quick wash program. Take your grilling expertise to a new level with a rotisserie function in your oven. The large skewer included enables you to secure the meats, the food rotates while cooking resulting in a succulent grilled finish. 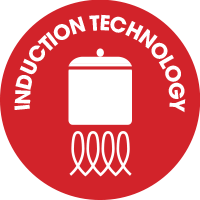 The pot size is automatically recognised when placed on one of the induction zones allowing for the required power to heat the size of the pot, saving energy. If the pot is too small or not suitable for the induction cooktop, the display indicator will flash. Steam cooking is ideal for fish, poultry, vegetables and even meats and pastries. Steam cooking maintains the nutritional value in foods. It can also be used for reheating and rehydrating and is ideal for defrosting as it prevents damaging and drying out of the food structure. Using combi and Steam you can also add moisture to your baking ensuring your roast dinners are tender and juicy while breads and cakes will turn out delicate and moist. Store all your pots and trays in the lower storage drawer creating extra space in your kitchen. Cooking is easier and safer with telescopic runners. Designed to safely slide out so you can turn baste or taste. Little inquisitive fingers are kept safer through our triple glass door combined with the technology that moves ambient cooling air through the door achieving a distinctly cooler door surface temperature. The turbo condensor drying system extracts steam at the end of the cycle leaving dishes dryer. 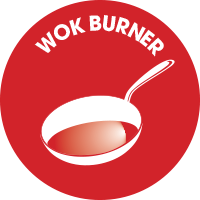 The dedicated wok burner generates higher heat and cooks more quickly. The triple ring system provides a more even heat distribution across the base of the wok. It is ideal for asian style cooking but also boiling water or soups quickly.